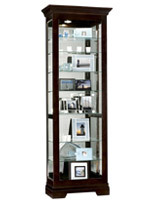 This Display Cabinet Includes Six Glass Shelves with Plastic Locks and a Halogen Lighting System! 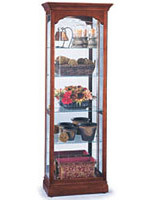 This Display Cabinet Is a Cherry Wood Finished Curio Cabinet with a Glass Front Door! 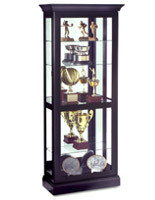 This Display Cabinet Is a Very Popular Model! 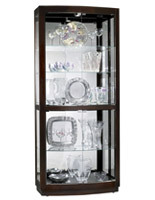 This display cabinet is crafted by the masters at the Howard Miller Company. H. Miller's name stands for unsurpassed quality and craftsmanship. 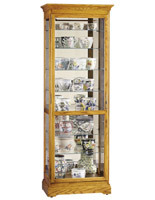 A china cabinet is the ideal display cabinet to give known as a wedding or anniversary gift, as it is sure to be passed down from generation to generation. A No-Reach™ light located on the glass cabinet back to provide easy access to lighting. 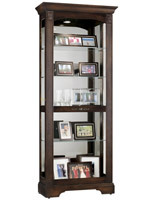 A side-to-side sliding, locking door to provide easy access to, as well as security of, your collectibles. Six adjustable shelves with Pad-Lock™ cushioned metal shelf clips for added stability. Interior lights for a brighter, whiter, more natural way to showcase your items. A mirrored back to beautifully showcase your pieces. Plate grooves for added security of dishware and other vertically oriented pieces. A beveled glass front door for a little extra elegance. 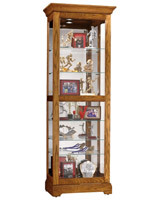 This display cabinet incorporates six shelves to accommodate all your family's collectibles. 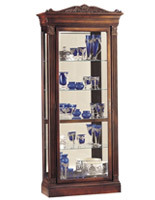 A Cherry finish gives the display cabinet a warm, homey mood.